Working for a living doesn’t have to mean living at work. Whether you’re balancing a budget in Excel or crafting a high-powered presentation in Keynote, there are plenty of ways to save time and still impress your boss. If you’re a WordPerfect user who has recently converted to the Mac, you may be frustrated that Word and Pages lack keyboard shortcuts for your often-used commands. For example, WordPerfect users accustomed to pressing control-F7 to insert a new footnote will be stuck taking the long route in Word and Pages; both programs require that you open the Format menu to insert a footnote. Accidentally adding misspelled words to a custom dictionary can lead to trouble: misspelled words in important documents. But not to worry—fixing them is probably easier than you think. In Word, select Preferences from the Word menu and click on the Spelling And Grammar button. Under the Spelling section of that preference pane, click on the Dictionaries button. In the window that appears, select Custom Dictionary and then click on the Edit button. A new Word document that contains all the words in your custom dictionary will open. Correct the misspelled words; then save and close the document. 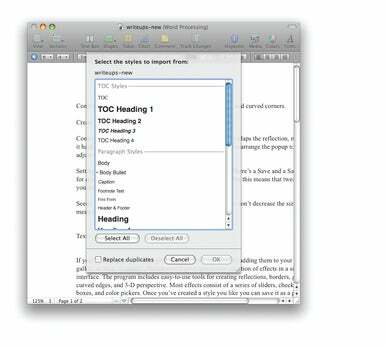 Pages lets you import your old Word templates with special paragraph styles. Word 2008 includes a new feature that lets you completely change the colors in a document simply by selecting a new theme from the Document Theme tool in the Formatting Palette (you must be working with a .docx file to access this feature). But while it’s easy to switch to an existing Word theme, it’s not possible to create a new theme in Word. Instead you need to use PowerPoint 2008. To view all your workbook’s worksheets simultaneously, simply open each in its own window and have Excel neatly tile them for you. In a complex Excel workbook, it’s easier to use a specific range of cells in a formula if that range is named 2008.Sales than if it’s named Sheet!$D$2:$BB$56. Likewise, when your state government raises the sales tax, it’s far simpler to change a single constant named Sales.Tax.Rate than to hunt down the previous rate throughout your workbook. 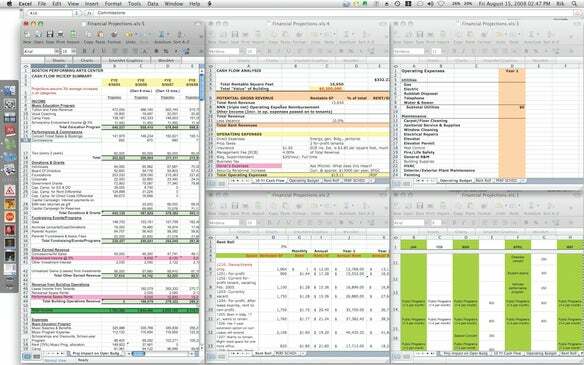 That’s why Excel lets you name individual cells, cell ranges, and constants. To name a cell or a range of cells, select it, enter the name you want in the Formula bar’s Name field (by default, this field simply shows the active cell’s address), and then press return. Note that names must not contain spaces, so use periods or underscores to separate words in your names, such as vacation.supplies or vacation_supplies. Once you’ve named important cells, you can quickly jump to them by entering the name in the Name field and pressing return (or pressing control-G and selecting the appropriate name from the list that appears). Note that you can use this navigation aid to jump from worksheet to worksheet in the same workbook. Need to quickly sort the cells in a column? Unlike Excel, Numbers doesn’t require that you first select the range of cells you want to sort. Instead, just hover the cursor over a column’s reference tab until the arrow appears, click on the arrow, and then select either Sort Ascending or Sort Descending from the contextual drop-down menu. The entire table will sort according to the contents of the selected column.